​​The Primary Years Program strives to develop the child as an inquirer, both in the classroom and in the world outside. The Middle Years Program is a five-year exploration of connections between academic subjects and the world. The Diploma Program is a challenging two-year curriculum widely recognized as the world standard for college preparation. 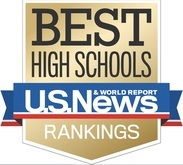 Stockton Collegiate International Secondary School ranked #8 in the state of California and #76 nationally on the ​Washington Post's most recent list of America's Most Challenging High Schools. Stockton Collegiate earned a 86% Equity and Excellence ranking. Stockton Collegiate International Secondary School earned a 2018 gold medal by ranking #3 in the state of California, #37 nationally, and #13 among charter schools nationally on the US News & World Report's list of Best High Schools. Stockton Collegiate International Secondary School is accredited by the Western Association of Schools and Colleges. Stockton Collegiate International Schools are free, public charter schools serving students in kindergarten through twelfth grade. The mission of Stockton Collegiate International Schools is to offer the rigorous, relevant, and practical International Baccalaureate to students grades K-12 in order to prepare them for post-secondary education and global citizenship in the 21st century. Stockton Collegiate International Schools enables students to become literate, self-motivated, lifelong learners by providing a multi-cultural, student- centered environment.